We provide a variety of products from glass wafers for MEMS devices used in projectors or pressure/acceleration sensors to microfluidic glass products for the biotechnology/medial industries based on the customers’ need. In addition, we have started providing processing of chemically-strengthened glasses for the touch panel industry. Can be used as general-purpose via wafers with the holes plated to form electrodes. Also suitable for cell-culture systems. Suitable for multilayer packaging by combining with semiconductor wafers such as MEMS devices. 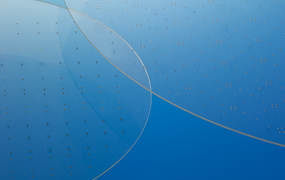 Microfluidic glass products with excellent thermal and chemical resistance. The microfluidic channels can be flexibly designed in 3 dimensions.